National Medals and PBs at U13/15/20 Indoor Nationals! This weekend it was the turn of our U13, U15 and U20 athletes to take part in their Indoor National Age Group Championships and there was lots of success for all our athletes! Saturday started off with Grace running in the U13G 60m, where she won her heat (8.53s), her semi-final (8.45) and then another PB of 8.32 in the final to win a SILVER medal! She followed this up with a PB of 30.01 in her heat of the 200m. Well done Grace! Sam was up next in his first ever National Championships, starting off with theU13B 60m. He ran a great PB of 9.11 in his heat to qualify for the semi-final where he ran another great time of 9.33. He then also ran a PB of 30.27 in the 200m to qualify for the semi-final where he ran a time of 30.91. Well done Sam! Beth was up next in the U20W 60H, where she ran a strong heat to qualify for the final, where she finished 6th in a time of 9.59. Beth also ran on the Sunday in the 60m, where she ran a great time of 8.39 in her heat. Well done Beth! Jamie ran next in the U20M 60H, where he ran a great PB of 9.19 to finish 4th. He also took part in the High Jump on the Sunday, where he jumped a fantastic 1.78m. Well done Jamie! Jacob took part in his first 1500m in the U20 age group, where he ran a great PB of 2:44.44! Well done Jacob! Rebekah ran in the U13G 800m in her first ever National Championships, and ran a fantastic PB of 2:44.75 to finish 5th in her heat. Well done Rebekah! 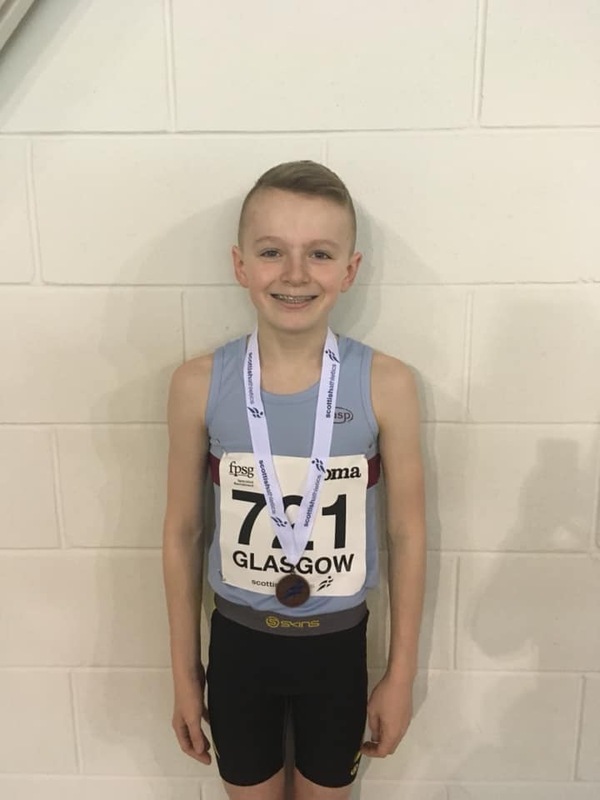 It was also Grant’s first ever National Championships and he chose to take part in the U13B 1500m. He ran a massive PB of 5:23.48 to finish 8th overall. Well done Grant! 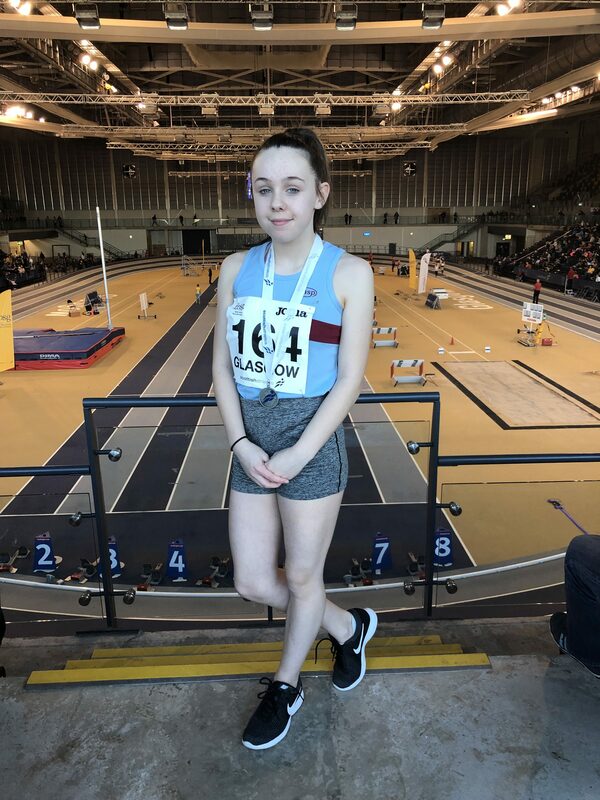 And Lucy was also taking part in her first ever National Champs, kicking off the Sunday events with the U15G 60m where she ran a fantastic PB of 8.52 to qualify for the semi-final where she ran another good time of 8.62. She then also took part in the 200m where she ran a time of 29.98 in her heat. Well done Lucy! Adam was up next in the U15B 60m, where he ran a PB of 7.91 in the heat to qualify for the semi-final, where he ran another PB of 7.90 to finish 5th. Well done Adam! Ethan was next up in the U15B 60H, where he ran a PB of 9.72 in his heat, which he then followed with another PB of 9.56 to win a BRONZE medal! Well done Ethan! Euan also ran in the U15B 60H, where he ran a PB of 10.17 in his heat to qualify for the final, where he ran a time of 10.35. Well done Euan! Niamh took part in the U15G 800m, where she ran a strong race to finish in a time of 2:42.65. Well done Niamh! And Rory also took part in the 800m in the U15B race, where he ran a great time of 2:29.04. Well done Rory! Owen ran in the 400m where he finished 3rd in his heat with a great PB time of 51.58. Well done Owen. And finally Hana threw a great PB of 7.41 in the U15G shot put to finish 8th overall. Well done Hana! Congratulations to everyone who took part from all the coaches at the club, we are very proud of you all!